The ARB Fridge Remote Monitor will make all of your travels a little more comfortable. Easily view current fridge temperature, supply voltage and compressor status from the highly legible, backlit LCD display. With a 100ft line of sight or 50ft interrupted transmission range, the monitor is capable of displaying up to two fridges with the addition of a second transmitter. With a range of selectable channel frequencies, a number of fridge monitors can be used without inadvertently monitoring other fridges within a convoy. Supplied with quick release bracket and necessary mounting hardware. 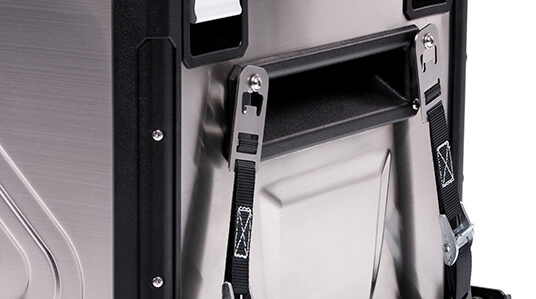 ARB’s tie down system is ideal for ensuring your fridge is secured at all times. With black powder coated steel clamps and plastic coated ends, matched with webbing straps and quality spring loaded clips, this accessory is a smart and functional addition for your ARB Fridge Freezer. Powder coated steel adaptor brackets bundled with stainless steel mounting hardware means fitment to ARB’s fridge slide is simple. The ARB transit bag shields your fridge from dents and scratches while also providing additional insulation in extreme temperatures. Made of tough, durable canvas, the functional ARB transit bag features a handy side pocket for items such as the power cord or instruction booklet, as well as openings for the fridge’s rubber feet, power cables and drain plug hole. 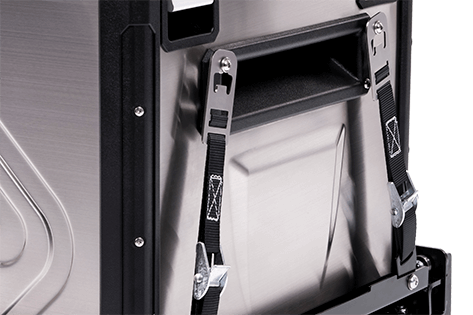 With a flat mounting base for secure fitment and multi position latch, the fridge slide will ensure easy access to your ARB Fridge Freezer at all times. Sealed roller bearings prevent dust ingress and incorporate a lock-in lock-out mechanism to ensure the slide stays in position no matter what angle your vehicle is on. Finished in a zinc-plated and black epoxy E-coat surface finish for superior corrosion resistance. The full extension fridge slide offers 100% extension capability, providing additional storage behind the 37qt or 50qt ARB Fridge Freezer. This additional space is ideal for storing equipment or a sealed battery. The full extension slide is designed to carry 265lbs of load (175lbs on the front tray and 88lbs on the rear tray). A drain hole cut out allows owners to extend the slide away from vehicle and easily drain the ARB Fridge Freezer. Bearing slides feature 4-way adjustable anti-vibration pads to prevent annoying rattles. ARB stocks a wide range of 12 & 24 volt wiring accessories to suit the fridge freezer, allowing flexible placement options or simply to hard wire the fridge into the vehicle. These accessories will reduce possible voltage drop as they employ 6mm double insulated auto cable. Along with a selection of speciality threaded sockets and surface mount housings; ARB can tailor a package to suit your individual requirements. Accessories to accompany your ARB Elements Fridge/Freezer including a slide, mount and tie down kit.